It’s like family here – Hilary Macleod, with her new novel Something Fishy in tow, visited Loyalist this week to invite people to come by the book’s launch on Nov. 21. She says she loves coming here for her book launches because people are so welcoming. Photo By Jack Carver. BELLEVILLE – A retired Loyalist professor is back next week to launch her fourth mystery novel. 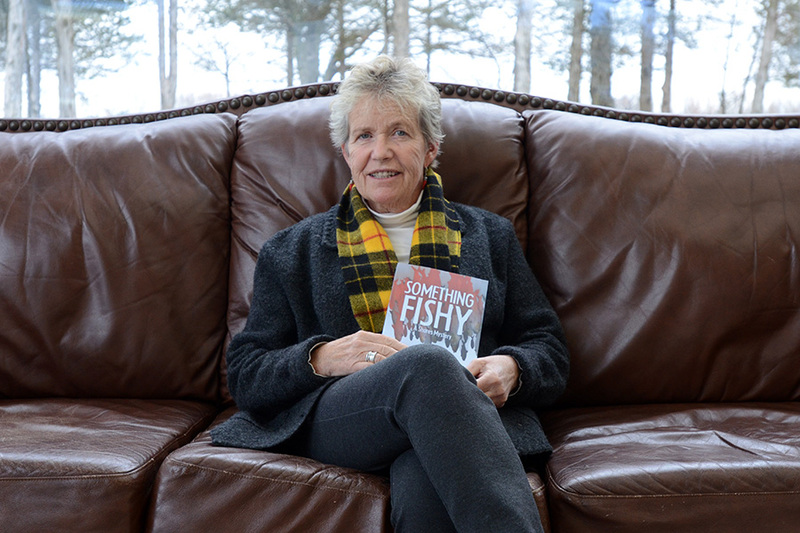 The book, Something Fishy, has already has its launch in Prince Edward Island, where the story is based. Now author Hilary MacLeod is back to her home in Prince Edward County, and holding the local launch in Loyalist’s Parrott Centre on Thursday, Nov. 21. MacLeod was a media-studies professor here at the college until 2011, but before that she had a successful career with a variety of news organizations. That life – with experience as a CBC writer-broadcaster and a radio reporter and news director for CHUM Quebec – was all about the hard facts and the newest stories. Now, with four books of the Shores series published and three more possibly on the way, MacLeod takes on her stories one year at a time. The slower pace might seem like a dream compared to the stress of cranking out content quickly for the news, but MacLeod said there’s one benefit to working with different stories every day as one does in the news business. So far MacLeod has nothing to be scared of. Her first three novels have been successful, with the first in the Shores series receiving a CBC Bookie award – like the viewer choice awards of Canadian literature. MacLeod draws her inspiration from her 23 summers spent on Prince Edward Island. The stories have been on her mind for most of her life, she says. Her first taste of writing a mystery novel occurred after she read M.C. Beaton’s series of novels featuring quirky Scottish police officer Hamish Macbeth. “I put the last book down, and I thought ‘Whoa, I could so do this.’ And then I wrote 35 pages,” she said. That was all the novel-writing she did for seven years, but when she took a sabbatical from Loyalist she decided that it was time to write some more. All the novels have been set in a small town called The Shores, a fictional place in P.E.I. where wacky murders and mysteries keep occurring. “The circumstances (that happen in the books) – the really weird ones – are from life. The person that pitched a tent in the kitchen to last out the winter in his family in All is Clam , that happened. I knew that guy. It seems like some fantastic imagination, but nope, it’s real,” MacLeod said. Some of MacLeod’s life seems like it could be fiction as well. Last week she showed up for a radio promotion for Something Fishy in a full lobster costume that she created herself. Lobsters and other sea life have been a recurring theme in her books. “(The lobsters) came with the novel (Revenge of the Lobster Lover). I’ve never given up lobsters ever since. I researched lobsters, and realized how weird they were. And how funny. And how creepy,” said MacLeod. That description could also apply to her novels in many respects. Reviewers cite the quirky characters and dark comedy, destined to entertain readers. MacLeod will be at the Parrott Centre next week with fish-shaped cookies in tow. She plans on not only speaking about her book but also discussing some of what she calls the “dark secrets of publishing.” For more information, check out her Facebook event.